DISTRICT BOUNDARIES Originally included Stillwater students that lived west of Greeley Street, but after the Greeley (or Western Row) School was built in the 1870s, the students then came from Stillwater and Baytown townships. The land for the school was donated by Henry A. Jackman and was located on a hill overlooking Jackman Pond, which has shrunk over the years following various road and building constructions. The school first opened with 65 students, but when Stillwater Special District No. 9 changed the boundaries, the number was down to 18 students when the above 1898 photo was taken. 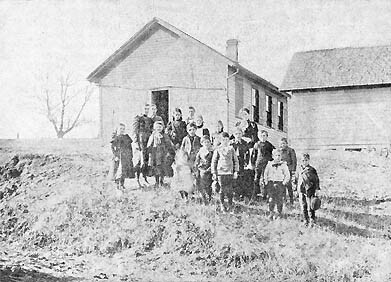 The post-1898 school pictured below was vandalized after it was closed in the early 1950s. Electricity and indoor running water was added to the school over the years, but outhouses were still in use up until it closed. It was razed for construction of Trunk Highway 36 in the late 1950s. 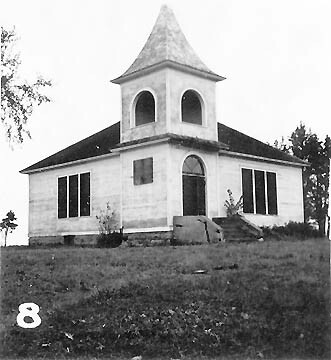 During the first term taught at the school, there were 65 students enrolled. In 1897, there were 19 students. School closed in 1955 then consolidated into Stillwater district. Jackman School in circa 1952. It was my 1st grade year, 1954, with Miss Montaham teaching at Jackman School where I learned to read, write and do math. Being the only student in 1st grade, I enjoyed the company o fthe other five grades and all their activities. The out-house was quite a thrill in the winter, but the cans of soup we warmed up on a hot plate, lessened the chill. I remember the Christmas programs and the gifts that were pasat out to everyone and all the wonderful Christmas carols we sung. We had several programs during the year and the last school picnic and its closing, for Jackman School in 1955 which was sad for me. It was sometime later, when the parents from jackman could come back and pick out any school books, blackboards, or school desks to take home for us to use in our homes. I spent many hours with my brothers and friends playing school, writing on the blackboards, reading the books while sitting at our desks. This is how I acquired this school desk I used, my two brothers, John, Dean, sister, Barb, and my DAD, John Kern used as well. Yes, my Dad attended, and made this wall hanging, when he was 7 years old. It’s quite a weaving for a 7 year old. those were good times and good years.